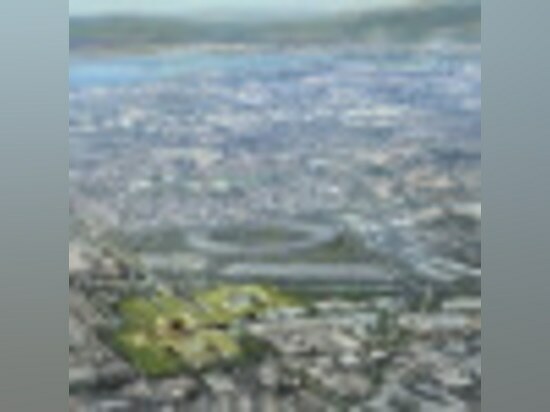 Architect Rafael Viñoly and Olin Landscape Architects have unveiled designs for the world’s largest green roof—a 30-acre community park in the sky sandwiched between Apple’s Infinite Loop headquarters and the spaceship-like Apple Campus 2 in Cupertino, California. 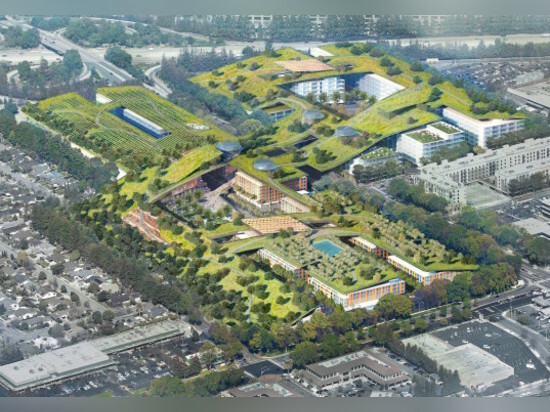 The enormous green roof is part of Sand Hill Property Company’s $3 billion renovation plan for the Vallco Shopping Mall, renamed Hills at Vallco. 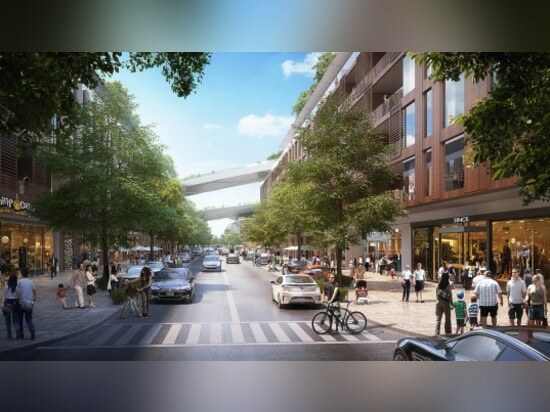 The ambitious project will transform the failed shopping mall into a sustainable and walkable LEED Platinum mixed-use community. The Hills at Vallco’s crown jewel is without a doubt its $3 million 30-acre green roof, an unprecedented engineering feat that’s “at least twice as big as anything attempted before it.” The elevated community park will include 3.8 miles of walking and jogging trails along rolling hills, orchards, vineyards, meadows, organic gardens, children’s play areas, and a sanctuary for native fauna and flora. The sustainable green roof will help Hills at Vallco achieve LEED Platinum certification by growing native, drought-tolerant and climate-responsive plants; reducing the building’s energy demands with natural ventilation and insulation; improving air quality; and counteracting the heat island effect. Recycled water and recaptured rainwater will be used to irrigate the park. On street-level, the new mixed-use neighborhood will feature a highly walkable and bikeable downtown street-grid anchored by two town squares. Parking would be primarily tucked underground and a transit center may be built at the shopping center. The 15-block street grid will be filled with 625,000 square feet of retail, 2 million square feet of office space, and 800 residential units. The residences include 680 market-rate apartments, 80 affordable apartments, and 40 apartments for seniors. 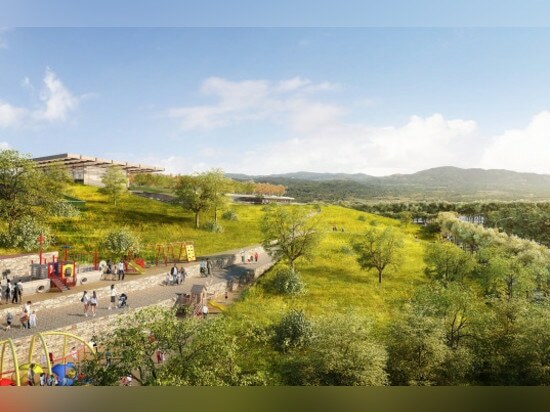 The family-friendly development will include plenty of restaurant and entertainment options, such as an AMC movie theater, ice rink, bowling alley, and fitness club. The town square may be used to host farmers markets and outdoor movie nights. “There will be nothing like it when we are done,” Reed Moulds, Sand Hill managing director told Mercury News. “We believe its community focus will make this a remarkable place to live, work, dine, play, learn, and recreate.” The Hills at Vallco design is the result of a long community engagement process to address the needs and concerns of residents. Sand Hill will contribute $40 million worth of amenities and funding to local school districts, and, if the project is approved by the city, will spend over $20 million to construct a new 700-student elementary school.